Ferrari saids it all they have no intention to put numbers up against Bugatti Veyron which they feel could cause a lot of problems, and they planned to design their own "right car" which is their Ferrari F70 the definite successor of Enzo. 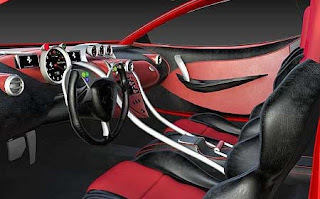 The design of this exotic car will be inspired by the Millechi concept, the body of Ferrari F70 is said to be made by light weight materials such as Carbon fibers with a monocoque chassis making it weigh only around 1,300 kilos. Ferrari F70 runs with an engine made of an Aluminum V8, with a double compressor that is approved in Euro V emission standards and it will be longtitudinal mounted in this exotic car. Since Ferrari doesn't want to go up against the numbers of Veyron its V8 engine is expected to produce a horsepower of 794 and with a torque of 570 lb ft, Ferrari F70 is also equipped with a 7 speed double clutch gearbox improving its quickness which results in making this exotic car accelerate 0 to 60 mph in just 2.7 seconds, and can get a top speed of 242 mph, it's definitely not up with the numbers of Veyron but then again Ferrari's not up to the world record so this wouldn't be an issue and if they want to win the battle of peoples favorite sports car then the exterior design of this Ferrari F70 would be the big factor. 300 exotic car of Ferrari F70 is expected to be produced by Ferrari in 2012, and it would cost around $1,700,000. how is 0-60 in 2.7, 242mph top speed and $1.7 million price tag "definitely not up with the numbers of Veyron."??? Hi, thanks for the comment, well as you may know in my previous article on the Bugatti Veyron, Veyron could accelerate from 0 to 62mph in 2.5 seconds which is 2 seconds faster than the F70 and 2 seconds is a big factor, while in terms of top speed F70 could go up to 242 mph while Veyron can run up 253 mph, and every 1 mph is a big deal so when you say 11 mph that's definitely a huge gap between them. If you're interested you can see the post Bugatti Veyron on my Car Topic links below. Thank you. No no no... Thats .2 seconds slower. Big Big difference from 2 full seconds. this is not final performance is it just someone specification from letter and bugatti acceleration is not 2 seconds is it 0.20 milisecond and the top speed of f70 is speculation,is not tested. LOLZ, reminds me of the batmobile, its juzt the girl version!